Born Käthe Ida Schmidt in Königsberg, East Prussia, to a middle-class family, Käthe Kollwitz had a liberal-minded father who encouraged her talent. In 1881, she took private art lessons with a copper engraver and, in 1885, enrolled in the School for Women Artists in Berlin. From 1888 to 1889, Kollwitz attended the School for Women Artists in Munich, where she took etching courses, in addition to her university classes. Two years after leaving the Munich school, she married Dr. Karl Kollwitz and moved to Berlin, where her husband treated primarily poor patients. In 1894, she received a prize from the German Art Exposition in Dresden for her etching cycle inspired by Gerhard Hauptmann's play The Weavers. By the beginning of World War I, Kollwitz was recognized as one of the most prominent German graphic artists and had already been involved with various social, political and artistic organizations, among them the Berlin Secession and Simplicissimus, a satirical magazine. In October 1914, her son, Peter, was killed in battle. His death fueled Kollwitz's anti-war sentiments, and her work became increasingly strong in its pacifist stance. In 1918, the Social-Democratic newspaper Vorwärts published her response to the poet Richard Dehmel's call for all able-bodied men and boys to die for the Fatherland. She quoted Goethe's words, "seed corn must not be ground," implying that the nation's future depended on its youth, which must not be squandered in a war of attrition. Kollwitz was appointed as the first female professor and member of the Prussian Academy of Fine Arts in 1919. Also during this year, she created the woodcut Memorial to Karl Liebknecht in honor of the murdered Spartacist leader. In 1921, she created the poster Help Russia for the Internationale Arbeiterhilfe, whose other members included Otto Dix, George Grosz, and Heinrich Zille. Kollwitz produced many images depicting the hunger and misery of the 1920s, as well as anti-war posters, among them Never Again War!. In 1928, she became the director of the master studio for graphic arts at the Academy of Fine Arts in Berlin. Throughout these years, she worked on a memorial to Peter, a sculpture of two mourning parents, which in 1932 was placed in the military cemetery in Belgium. Although Kollwitz was not harassed by the National Socialist Party as much as other artists, she was forced to resign from the Academy of Fine Arts, in part as a result of signing an "Urgent Appeal" to unite socialist and communist leaders against fascism. Another run-in with the Nazis occurred in 1936, when the Gestapo threatened her with deportation to a concentration camp due to an interview she had granted to Izvestia, the Soviet newspaper. However, Kollwitz was never deported. 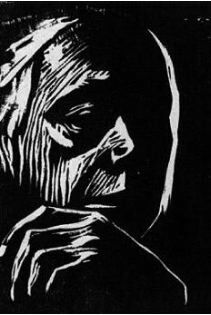 In 1942, the year her grandson was killed in action, Kollwitz created her last lithograph, Seed Corn Must Not Be Ground. She died in 1945, shortly before the signing of the armistice.